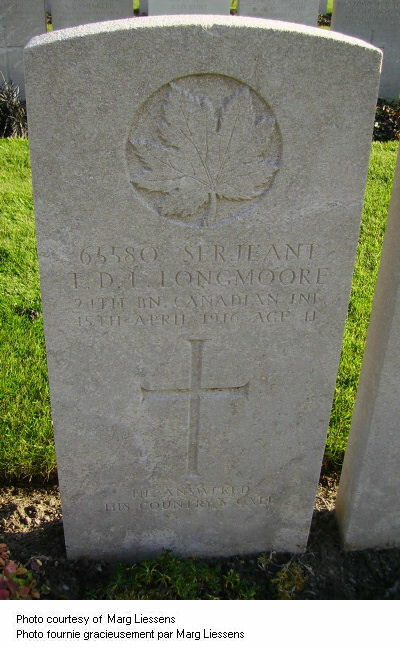 Son of Mary J. Longmoore, of 102, Birch Avenue, St. Lambert, Chambly Co., Montreal, and the late James Longmoore. 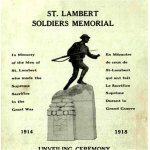 Commemorated on Page 120 of the First World War Book of Remembrance. Request a copy of this page. 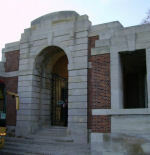 Lijssenthoek Military Cemetery is located about 12 kilometres west of Ieper town centre, on the Boescheepseweg, a road leading from the N308 connecting Ieper to Poperinge. From Ieper town centre, the Poperingseweg (N308) is reached via Elverdingsestraat, then over two small roundabouts in the J. Capronstraat. The Poperingseweg is a continuation of the J. Capronstraat and begins after a prominent railway level crossing. On reaching Poperinge, the N308 joins the left hand turning onto the R33, Poperinge ring road. The R33 ring continues to the left hand junction with the N38 Frans-Vlaanderenweg. 800 metres along the N38 lies the left hand turning onto Lenestraat. The next immediate right hand turning leads onto Boescheepseweg. 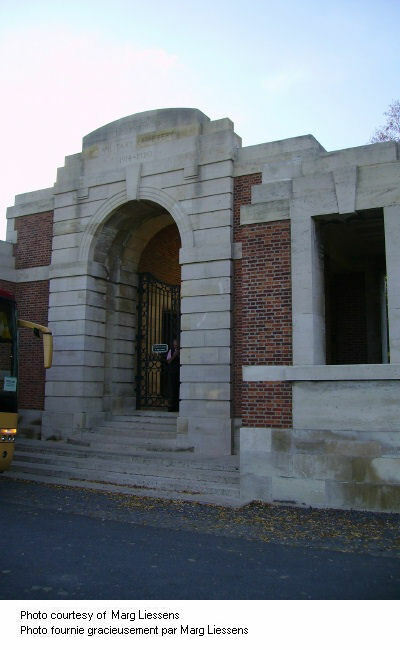 The cemetery itself is located 2 kilometres along Boescheepseweg on the right hand side of the road. From Calais, take the motorway A16 signposted Dunkerque/Lille. At Dunkerque take the motorway signposted Lille/Ypres, the A25. Leave the motorway at Junction 13, the village of Steenvoorde. Follow the D948/N38 signposted Ieper/Poperinge. 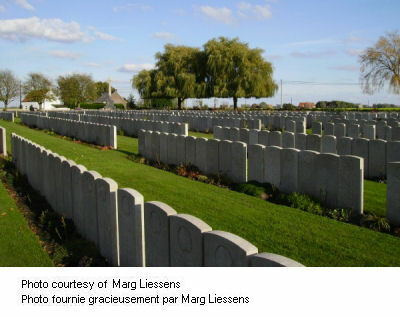 After approximately 8-10 kilometres Lijssenthoek Military Cemetery will be signposted off to the right. 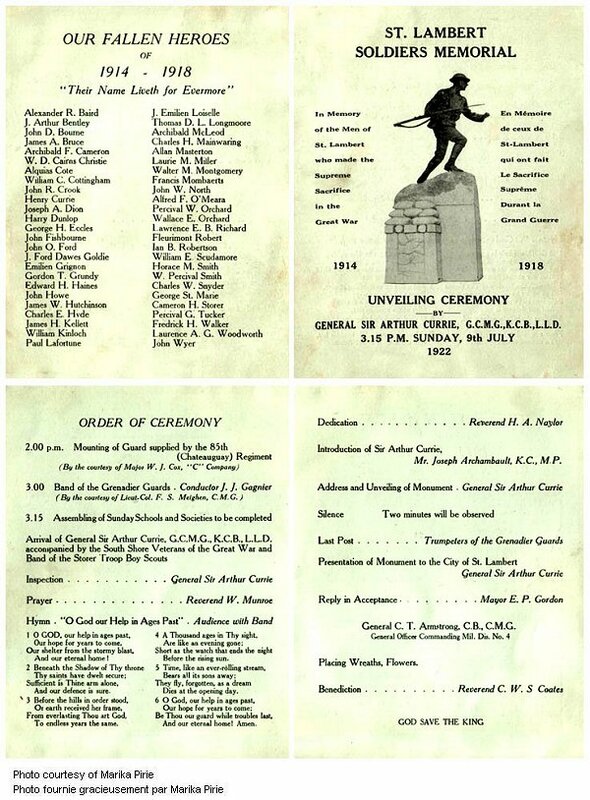 Program – Original program distributed at the unveiling of the St. Lambert, Quebec WWI War Memorial on July 9th, 1922.